It was hard to leave Arugam Bay. The warm ocean water, the chill surfer vibe, excellent food at Ram's and delicious breakfasts at Happy Panda kept us there for as long as we could push it. Eventually though, we knew we needed to start heading inland because we had spent nearly three weeks on Sri Lanka's north and eastern coastline. Home made okra, eggplant and, oh, papad fried in ghee! With one more week to go, we had little time to see one of the highlights of this awesome little country: the tea country! 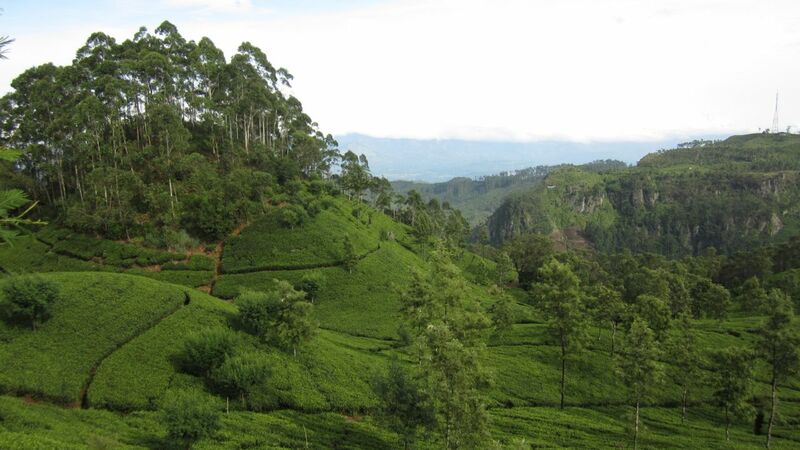 Both of us are really into tea and we wanted to go tea tasting and hike around all the tea estates we had heard about. We had to take a series of small buses to get to Ella from Arugam Bay, which naturally ended up taking all day. Upon arriving, there was a cool little guesthouse tucked away in the hilly portion of the town. 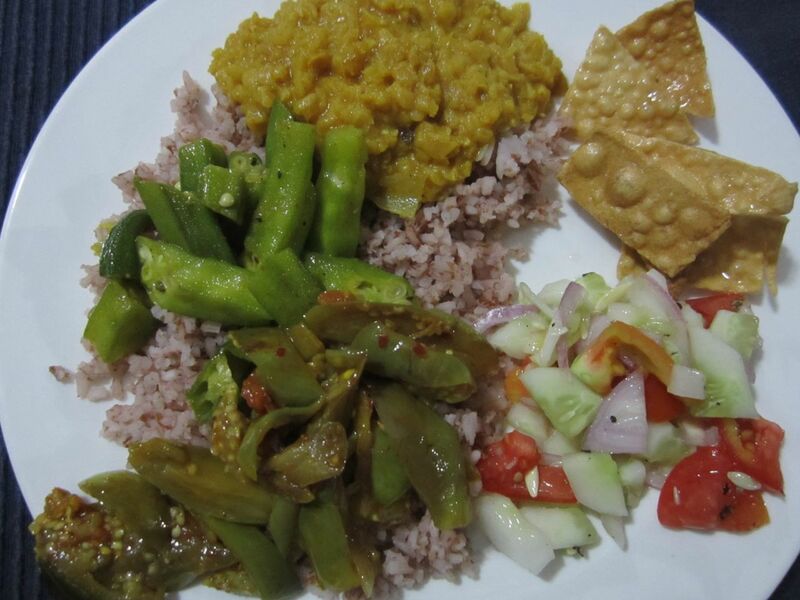 We were greeted by a nice pot of home-grown ceylon tea while the owner made us a delicious home-cooked vegetarian meal consisting of okra and eggplant curries, dal (lentil) and rice. For about $2.50 each, we ate all we could, still had left-overs and went to bed happily stuffed. 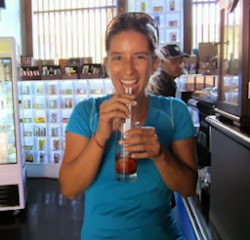 Ella has a chill vibe and is a great little place for outdoor activities. 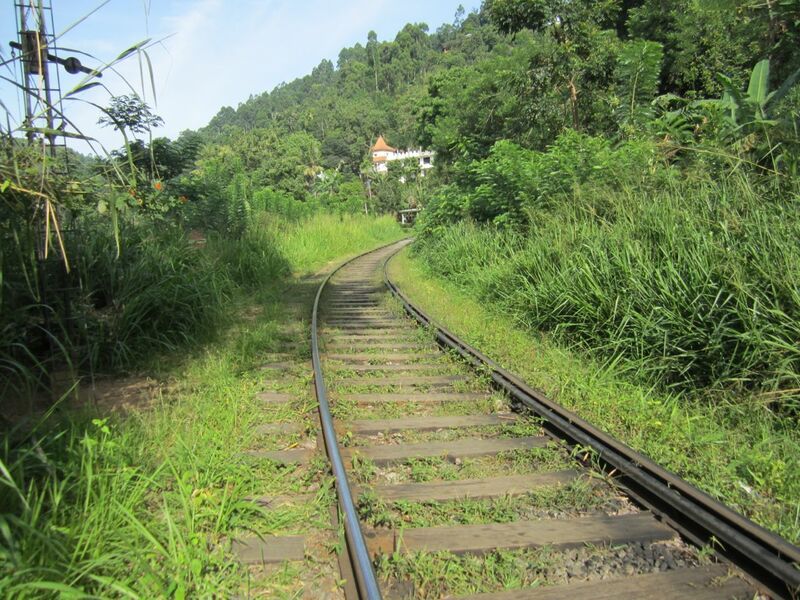 There's a great half-day hike that starts by following train tracks carved into the hillside. Half-way through, you can climb down to see a waterfall that flows underneath the tracks all the way down to meet one of the rivers in the valley several hundred feet below. After the waterfall break, we continued our trek and a very nice local barefoot man asked us if we needed help getting to Ella Rock - our final destination. Feeling a bit cocky we politely declined his offer and kept on walking. We missed our left turn and the very same man caught up to us and recommended we follow him. 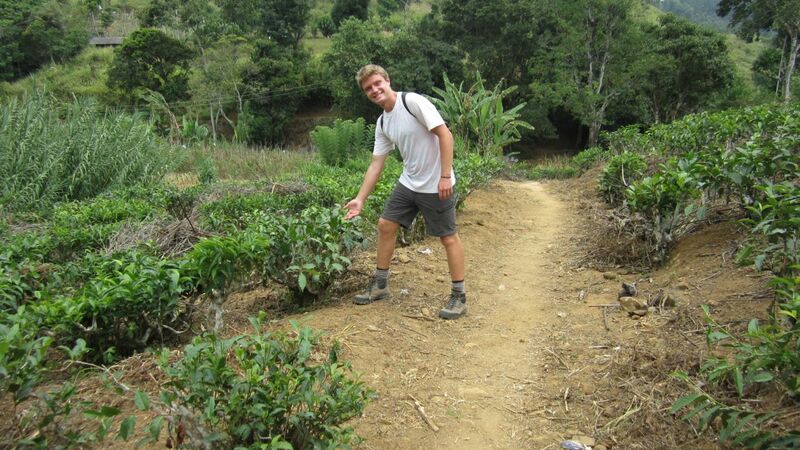 We walked through beautiful tea plantations and rice paddies and our friend signaled that he'd be happy to take us to the top. With the very nice local barefoot man at the top of Ella Rock! It turned out we did not really know what the hell we were doing so we welcomed our new guide. We thought it would be a slow hike up the steep slopes all the way to the top but we couldn't have been more wrong. Our friend practically ran up these very, very steep slopes and we got our asses kicked. We were huffing and puffing and trying really try to keep up with him. The terrain was rocky, uneven and very steep and the fact that our friend had no shoes, didn't bother him or slow him down one bit. It actually reminded us a lot of the incredibly fit sherpas and porters in Nepal. The final destination at Ella Rock was magnificent. 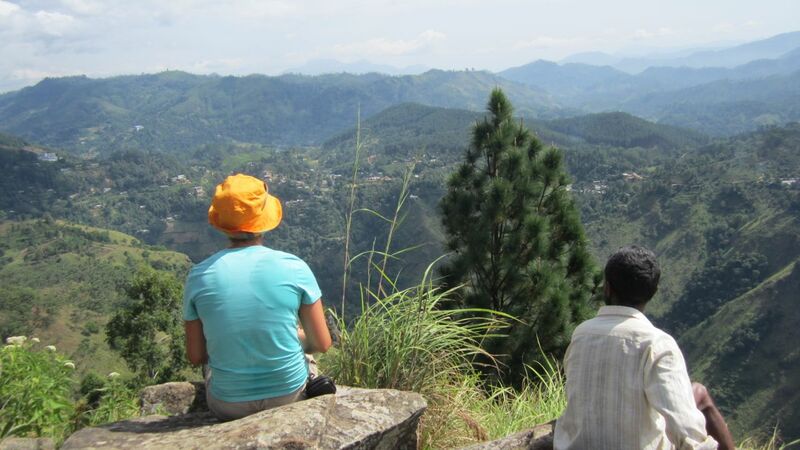 The top of the hill overlooks the entire little town of Ella, all the tea estates, the hills rolling away towards the east coast. 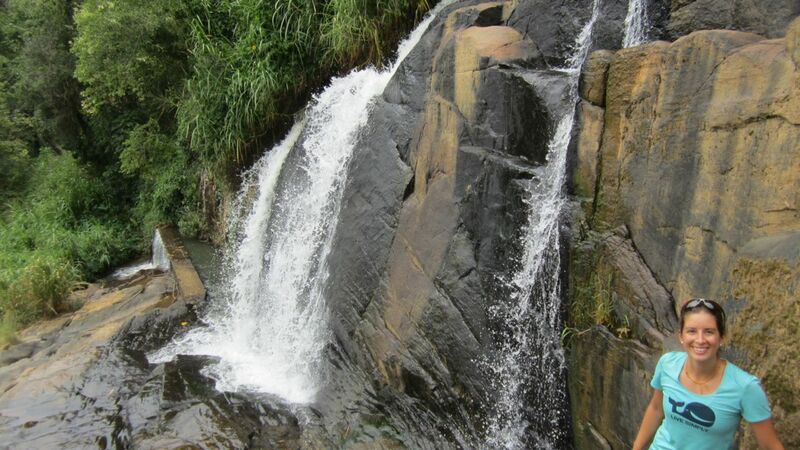 Plus, we could see several waterfalls flowing down the mountains. We thanked our guide and gave him a tip for his excellent services. He smiled, thanked us and went sprinting down the hill. 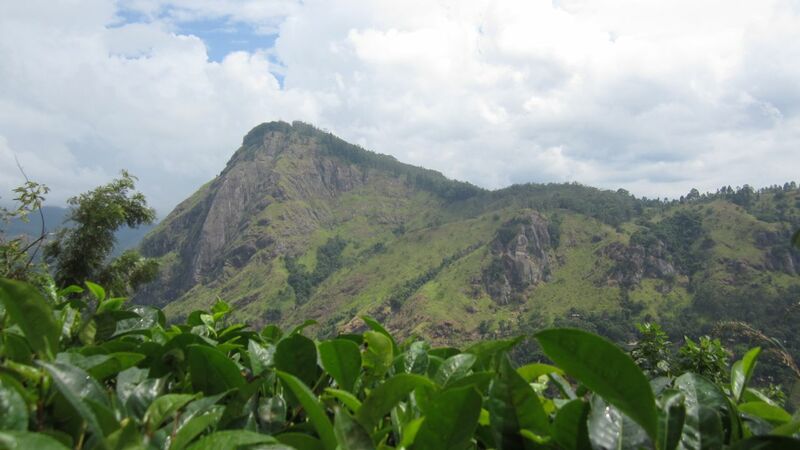 Directly across from the top of Ella Rock, we saw Little Adam's peak, our next hiking destination. It's nothing like the real Adam's Peak (or so we hear) but fun nonetheless. The 360 degree views from the top of Little Adam's peak was a treat although it is much lower than the top of Ella Rock. From Little Adam's peak, we saw the beautiful tea estates of 98 acres, a fancy-pants resort with a swimming pool, restaurant, bungalows and, well, 98 acres of tea. We took a break and sat on their outdoor deck, nested in the midst of thousands of tea plants with excellent views of Little Adam's peak and more rolling hills of tea. 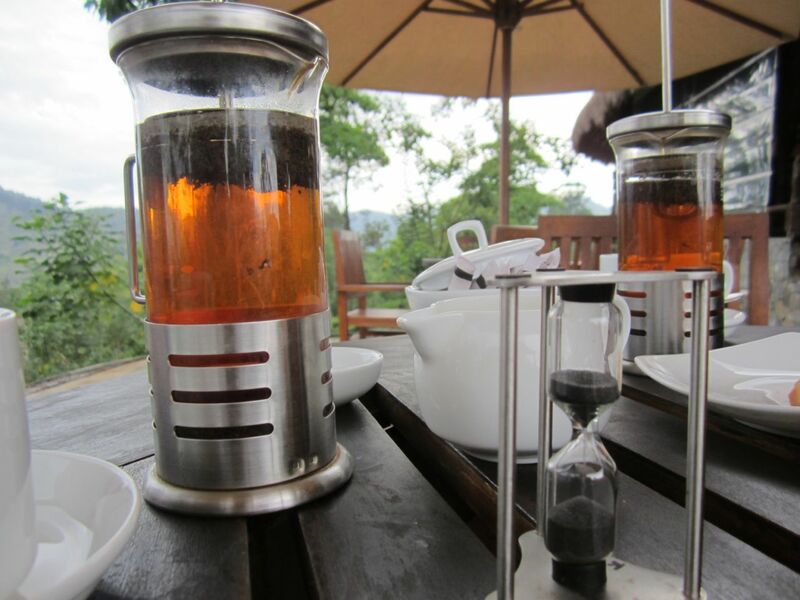 They served delicious Ceylon tea in individual french presses with an hourglass that got the steeping time just right. 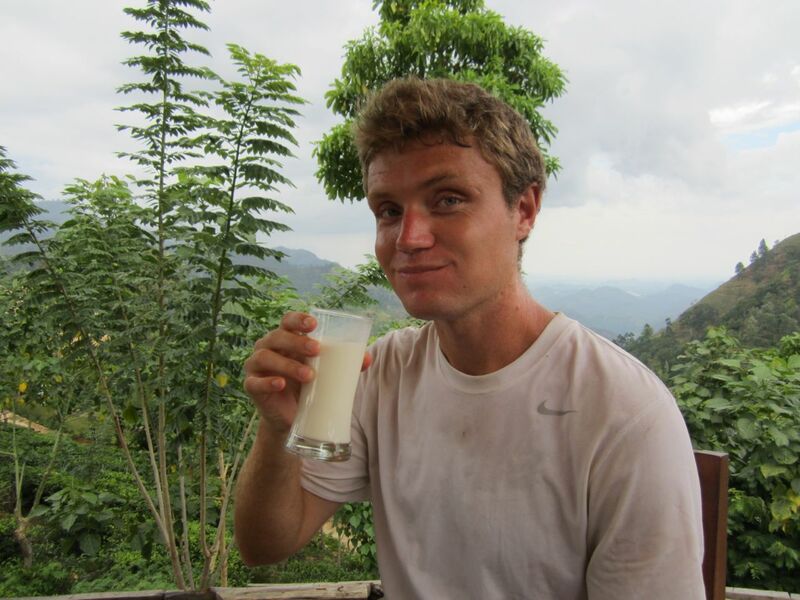 To Eliot's delight, the restaurant boasted its use of fresh and locally sourced milk for the ceylon tea so he decided to order a full glass of it. Drea had to try a little and we both agreed that it was the damn finest milk we had had in a long while! The glass is always fuller... with fresh milk! The tea adventures continued as we did a short little hike to one of the only green tea factories in Sri Lanka, conveniently located close to 98 acres. The tour of the factory was fascinating and the smell of green tea was amazing! We got a great deal by getting a quarter of a kilo of Sri Lanka's finest Gun Powder 3 (GP3) for less than $5 bucks. Although there is not a whole lot more to do in Ella, it's definitely worth a one or two night stop. Plus, you are really close to Haputale, another magnificent little town where you can watch the sunrise and enjoy some of the best 360 degree views in all of Sri Lanka (if you're lucky and don't' get fogged in!) at the famous Lipton's Seat. If you do decide to go, we recommend heading out there early and hiking the 6 kilometers of tea paths all the way to the top instead of cheating and driving up in a tuk-tuk. "Unfortunately" for us we had to leave Sri Lanka because our visas ran out and we had to hop on a short plane ride to this little country you may have heard of... the Maldives!